How can we convey the immensity of the endless southern lands, inhabited in the 16th century by indigenous people known since then as the Fueguinos? Where does the history of the European ‘discovery’ of these lands begin? Between the Isla Grande (Big Island) of Tierra del Fuego and the surrounding channels and archipelagoes, or between the Strait of Magellan and the region of Cape Horn? Since the Portuguese navigator Ferdinand Magellan reached this land, the Terra Australis Incógnita, the ‘unknown southern land,’ had gradually become known. As more and more ships plied these waters—those of Magellan himself (1520), Juan Ladrillero (1558), Francis Drake (1578), Pedro Sarmiento de Gamboa (1580), Thomas Cavendish (1587), Olivier Van Noort (1599), Isaac Le Maire (1616), Jacques L’Hermite (1624) and many others—a picture of that part of the world began to emerge: here was a region that stood in stark contrast to the lands of the Northern hemisphere. Here, the land was surrounded by a great sea full of islands, channels and archipelagoes, as well as waterways connecting the Atlantic Ocean to the southeastern Pacific, Polynesia, the Spice Islands of Indonesia, and the Far East. These waterways were the Strait of Magellan and the Strait of Le Maire, also known as the Cape Horn route. The desire to reach and explore increasingly distant lands had sparked the imagination and given rise to personal aspirations and the desire for conquest. The ocean voyages of these Spanish, Portuguese, English and Dutch sailors through the territory of Tierra del Fuego revealed that these were indeed the last of all the known lands. These navigators possessed cosmographic, geographic and astronomical knowledge, and were dedicated and determined men who shared a single mission: to explore. They were driven to learn and to document what they found; it was necessary to learn about places before one could control them. And how did the 16th century Europeans come to know about the native inhabitants of these southern lands? In 1519, Ferdinand Magellan proposed to the Spanish court that he undertake a sea voyage to find a route to the East Indies. His ships, the Concepción, San Antonio, Trinidad and Victoria, sailed from Seville with a complement of around 230 men. The fleet sailed down the Guadalquivir River to the port of San Lúcar de Barrameda, where they entered the Atlantic and the journey began in earnest. After a stop of several days in the Canary Islands, the ships sailed to the Cape Verde Islands, then followed the African coast southward, passing by Guinea and Sierra Leon. They then sailed across the Atlantic, crossing the equator before arriving at the present-day Port of Río de Janeiro. The crews sailed along the South American coast, always within sight of the mainland, and reached Río de La Plata and Bahía San Julián, where they rested for several months over the winter. There, they saw a “man the size of a giant, virtually naked, who danced and sang while he sprinkled sand on his head.” They described him as having a broad face outlined in red paint, with red paint around his eyes and cheeks as well. His clothing was made from the sewn-together skins of an animal that the Spaniards described as “ having the head and ears of a mule, the neck and body of a camel, the feet of a deer and the tail of a horse.” Today, we know this animal as the guanaco. In his hand the giant held a short thick bow. He carried a cane quiver of feathered arrows with heads made of white and black flint. The Spaniards were surprised that the arrowheads were not made of iron. The newcomers showed the man some trinkets, including a mirror, bells, a comb and glass beads. Other natives arrived and offered the Spanish sailors “some white powder made from the root of some plants.” The Europeans invited them to their ships, and the women rather than the men carried the belongings. The men presented the Spanish sailors with four small animals of the kind used to make their clothing. A group of 18 native men and women boarded the ship. 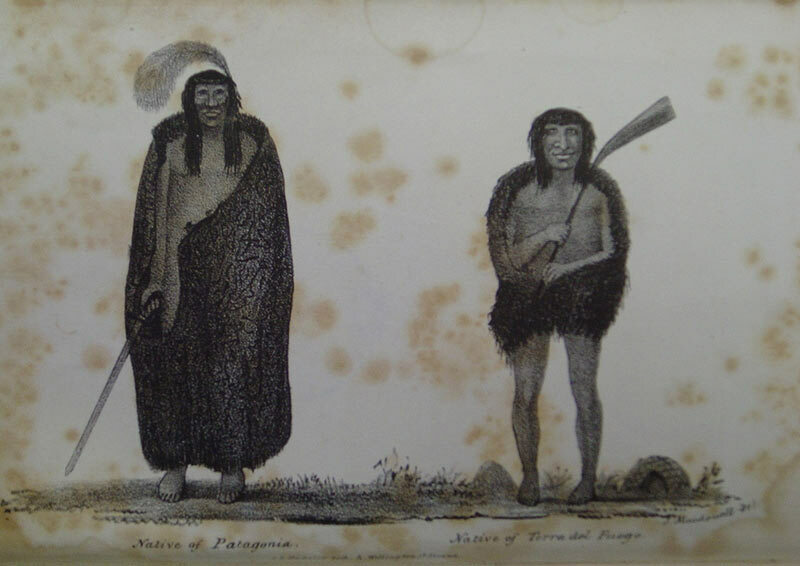 These were members of the Aónikenk or Tehuelche people who inhabited the far south of continental Patagonia. To the Christians, they were gigantes patagones (big-footed giants). During their time in Bahía San Julián, the Spaniards observed the indigenous way of life, noted their attire and their dwellings, the food they ate and any other details they could record about these people. When spring arrived, the sailors departed from San Julián and continued south. In October 1519, they came upon a straight that led to another ocean, which they named the Pacific. The passage was lined by high, snowcapped mountains. Magellan decided to sail through the strait, passing bays, coves and channels. On land, they saw bonfires lit up, and called the place Tierra de los Fuegos, the “land of fires.” As they sailed, the sailors attempted to ask the indigenous giant who accompanied them the names of the things that they saw. One day he fell ill, and they baptized him with the name of Pablo; he died shortly thereafter. Magellan’s expedition emerged from the straight in late November and set sail for the Philippines. In 1558, Spanish navigator Juan Ladrillero took possession of the same lands in the name of God, the Crown, and the Governor García Hurtado de Mendoza. There, he encountered another people that he described as “medium-set and poorly proportioned,” who subsisted on fish, shellfish, sea lions and birds, and who clothed themselves in the hides of sea lions and other animals, who traveled in canoes and did not live in villages. These were the so-called “small people” of Fuego-Patagonia. Years later, the infamous pirate Sir Francis Drake also witnessed these marine hunter-gatherers moving about in their tree-bark canoes. The Europeans described them as the “wild people” of that territory. In 1580, Pedro Sarmiento de Gamboa was performing a vital mission: to explore the Strait of Magellan in search of sites that could be fortified against the imminent threat of piracy. After dropping anchor in one of the bays, his men went ashore and encountered the natives who lived there, which they described as tall people who went about with bows and arrows, dressed in animal hides. These were the inhabitants of Tierra de los Fuegos, whose private, social and spiritual lives were a mystery to the explorers. In the eyes of the Europeans, Tierra de los Fuegos was populated by both giants and small people. The giants were the Ona or Selk’nam people, land-based hunter–gatherers who inhabited the big Island of Tierra del Fuego. The smaller indigenous people were the marine hunter-gatherer Yaganes or Yámanas, canoeists who inhabited the channels and archipelagos of the Cape Horn region; and the Alacaluf or Kawashkar people, who lived in more circumscribed zones along the channels and archipelagoes of the Strait of Magellan up to the Gulf of Penas and perhaps further afield. These people also traveled along the coast of Western Patagonia, where they interacted with another canoeist group, the Chonos, in the Guaitecas archipelago and smaller islands off the southern coast of Chiloé Island. For several centuries, European contact with these human groups was intermittent. By the 19th century, however, European activity in the Fuego-Patagonia region—the mass hunting of marine mammals, mining activity, and large-scale cattle and sheep ranching in estancias—severely harmed the way of life of these peoples. But that is another story, centuries removed from those early 16th century interactions between the European navigators crossing the indigenous waters and the native groups, with their animal hide capes and feather headdresses, their compact painted bodies, so few in number and yet so significant. Thus did the Kingdom of Chile extend over these southern lands. However, northward of this region, up to the Chiloe Archipelago, was a no man’s land. This was the true southern frontier, the southern Araucanía region, which lay between the Tolten River and Chiloe Island. Here the Mapuche, Huilliche and Junco peoples constituted a real threat to the Spanish presence. Just south was the gateway to Patagonia, the land considered the doorway to the Strait, the very ends of the Kingdom. Legend had it that the Enchanted City could be found in that region, the “City of the Caesars,” where gold and silver and precious stones could be found in abundance. The region, named Western Patagonia, straddled the mainland and offshore islands. The former was a land of fast-flowing rivers, densely-forested mountains and grass covered steppes, and was inhabited by the Puelche and the Poya, semi-nomadic hunter-gatherer peoples. Between 1551 and 1553, Pedro de Valdivia sent Jerónimo de Alderete and Francisco Villagra here to explore the area of Nahuelhuapi, and many of the local inhabitants were forcibly removed to cities further north, the Puelche and Poya subdued by surprise attacks and kidnappings. Insular Patagonia, a region of archipelagos, fiords and channels, was also peripheral to the Kingdom of Chile and was inhabited by the Chono, Caucaue and other indigenous canoeist groups. Well before the arrival of the Europeans, this band of islands had become a route to the southern coast and island, criss-crossed by indigenous watercraft called dalcas. The Europeans became aware of Insular Patagonia in the early 16th century, but it was not until the 19th century that they began to explore the mouths of its rivers and then the interior, which was later occupied to extract wood from the cypress forests and for large-scale livestock production. It was arduous work to open trails through the dense forests or to cross the southern swamps and floodplains, but the explorers managed to do so, using the watercourses as highways to travel inland and building settlements upon their banks, many of which remain today.